'Life-saving Waistcoat, Stole Inflated'. Stores reference 22c/447. Size medium. The cloth is in excellent overall condition, retains good colour but is a bit grubby. 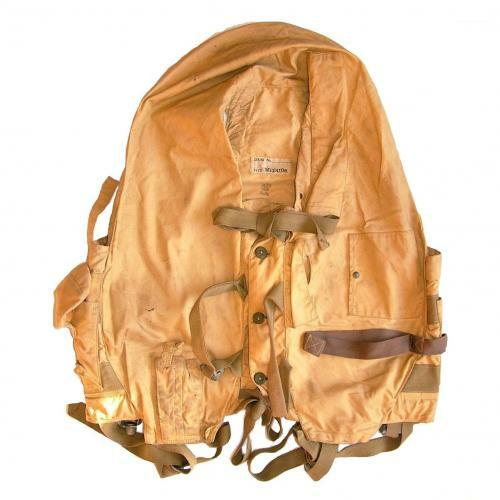 It retains all leg straps, both grab handles, tying tapes and original buttons, inflation lever flap, fluorescene flap/strap, skull cap/heliograph pocket and flotation lamp pocket. This example also has three cadmium plated dinghy lanyard connector sockets attached. Good original brass zip. With label and Air Ministry contract ink stamps. A very good '+' used example. Stock code MW21567.